As the oil price hit a four-year high, the Oilholic found himself in Madrid, Spain, mixing it with the technologists driving process optimisation, Artificial Intelligence, Industrial Internet of Things (IIoT) and all the rest of it in the oil and gas industry, at the Honeywell Users' Group conference. The event was the annual jamboree of global software-industrial giant's automation outfit – Honeywell Process Solution (HPS). The 2018 round, held in Madrid, Spain, carried additional significance for more than one reason. It was the event's 30th edition, and while the first one back in 1989 would have been as much about software as it would have been about nuts, bolts and consoles, the latest instalment turned out to be anything but. Additionally, it was also recently appointed HPS President John Rudolph's (above left) first meaningful interaction with analysts and media outside of the Americas, having taken over in May from Vimal Kapur, who led the outfit in the oil and gas downturn of 2015, as a bit of an optimisation and efficiencies evangelist in trying times. And Rudolph told this blogger the efficiency and throughput gains made by HPS clients under his predecessor (who has moved on internally within Honeywell), are only going to be notched up further. "That applies equally to upgrades of legacy estate, as well as starting from scratch with clients' new builds. Efficiency is a one way street. If you are impacting efficiencies, you are also impacting waste; opportunities are a lot greater than we imagine." The new HPS boss added the company is just starting out with its connected plant solution (more info here), which as the name suggests, is its plant operating platform predicated on big data and IIoT. That's so true, because as recently as 2010, gatherings of this nature were as much about software as they were about hardware. Now software dominates, to quote Jason Urso, HPS' Chief Technology Officer (below right). "We've effectively decoupled software from hardware," Urso added. That means the TDC 3000 – that old industry work-horse of a plant control system Honeywell introduced in the 1990s – can now have its digital twin for oil and gas customers hosted on Honeywell servers with no need for additional physical equipment, enabling applications, controls, displays, upgrades and performance monitoring via digital avenues. "The world we are heading for is about software driven automation with infinite industry and outcome focussed upgrades. The TDC 3000 is no exception," Urso told the Oilholic. Improved plant control, means digital is proliferating to enhance productivity, in some cases "by as much as 10 times" mitigating unplanned downtime and equipment underutilisation. All sorts of kit, sensors and drones are turning data into knowledge that business analysts can interpret to bring about further improvements. 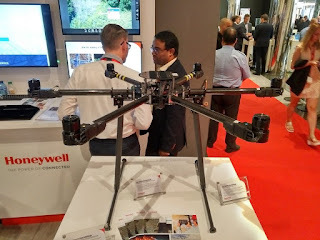 The most visible example of this was offered at HUG by Honeywell's drone (see below) – a star attraction of the conference's exhibition floor (minus its rotors for health and safety reasons of course). The drone is being deployed by oil and gas downstream, midstream players, and utilities to inspect anything ranging from power-lines to pipelines. Not only does it carry out safety inspections and monitoring, the drone also gathers performance data, as programmed by the site manager for fixed inspection distances. Additionally, the related sphere of health, safety and training – a billion dollar business by Rudolph's own admission – is benefitting from digital as well via augmented reality and intelligent wearables. Basically, Honeywell and its peers are bringing immersive competency to industry training via virtual reality into the process, making trainees partake in a procedure virtually before actually doing it, and digitising instruction manuals via "active worker assist solutions" embedded into wearable equipment. Sum it all up, and you can get an idea of the kind process efficiencies we are talking about, not just in the oil and gas sector, but the wider manufacturing complex to be honest. Invariably, the key issue of industrial cybersecurity matters, especially as research suggests attacks are on the rise. So Honeywell also used the opportune moment of HUG to announce the launch of its new industrial cybersecurity consulting service, an area of its business where it has been investing millions of dollars to service clients. Here is the Oilholic's full report on the launch for Forbes should it interest you. Away from HUG, and back to oil futures, the market is turning bullish. In fact, too bullish for this blogger's liking! Brent is currently lurking either side of $85 per barrel. There is, at least in this blogger's eyes, a very real danger of the market overshooting. If, as many are only too keen to predict, the oil price hits three figures, then there is a real risk of the level being unsustainable given the hit it would have on global demand. Here's the Oilholic's take from HUG on TRT World. But that's about it from Madrid folks, it's time for the big flying bus home! Keeping reading, keep it 'crude'! © Gaurav Sharma 2018. 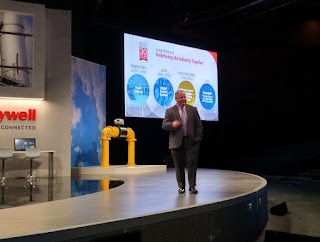 Photo 1: John Rudolph, President of Honeywell Process Solutions (HPS) addresses HUG 2018, in Madrid, Spain. Photo 2: Jason Urso, CTO of HPS. Photo 3: Honeywell's Industrial Drone on display at HUG 2018. © Gaurav Sharma 2018. To RDSA or RDSB - that's the question?